Madison Wade enjoys riding horses. She has grown up around horses at her family’s Southeast Georgia home and she loves that her gentle and loyal companions represent strength and adventure. Madison is comfortable in the saddle whether her horse is traveling at a quiet trot or a vigorous gallop. Because the 19-year-old woman rides horses effortlessly, many would never suspect that Madison lives with cystic fibrosis (CF), a chronic lung disease that complicates her life and threatens to block the active lifestyle that she so passionately enjoys. Madison, who is a student majoring in psychology at South Georgia State College and a graduate of Ware County High School, is one of 55 children who will be celebrated at the 10th annual Wolfson Children’s Challenge, scheduled for Jan. 26, 2019, at The Baseball Grounds of Jacksonville. The family-friendly fundraising event brings individuals and teams of runners together to hit the pavement in honor of the tens of thousands of children who are cared for by Wolfson Children’s Hospital each year. Gail Wade was pregnant with Madison when her daughter was diagnosed with cystic fibrosis, an inherited disease that is passed down through families. Madison’s older brother, Brent, also lives with CF, a disease caused by a defective gene that makes the body produce abnormally thick and sticky mucus. The mucus builds up in the breathing passage of the lungs and the pancreas, and results in life-threatening lung infections and serious digestion problems. Madison was born 10 weeks premature at a Jacksonville hospital and then transferred to Wolfson Children’s Hospital of Jacksonville as an infant. 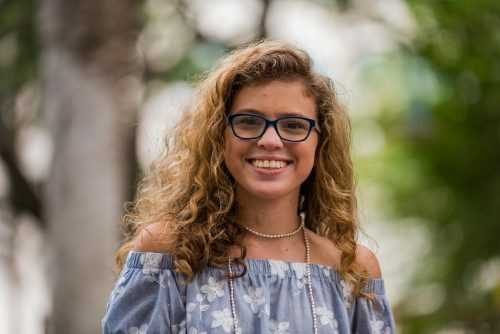 Until recently, when she transitioned to adult care at the University of Florida, Madison came to Wolfson Children’s every two to three months for check-ups. With treatment and the help of the medical team of specialists at Wolfson Children’s, Madison has learned how to manage living with CF. When symptoms, such as coughing, difficulty breathing or eating, or fatigue would increase, Madison would stay at the hospital where she received IV antibiotics to treat infections and other therapies to reduce the buildup of mucus in her lungs. While at Wolfson Children’s, Madison enjoyed participating in the therapy programs including Art with a Heart, music therapy and pet therapy. Spending time at Wolfson Children’s has inspired Madison to pursue a career as a child life specialist. Gail Wade is grateful for the special care and attention Madison received at Wolfson Children’s. Gail also appreciates the numerous hospital enhancements, such as the parents’ lounge, that have been designed over the years for patient families’ comfort and convenience. Wolfson Children’s has the region’s most comprehensive lung and respiratory programs for children, and its team of pediatric pulmonary specialists has extensive experience in successfully treating a wide range of conditions in infants to teens. Wolfson Children’s is accredited by the American Association for Respiratory Care (AARC), which means qualified respiratory therapists provide care to patients and follow a strict set of evidence-based protocols for patient safety. Wolfson Children’s Hospital provides lung and respiratory services in partnership with Nemours Children’s Specialty Care, Jacksonville. Wolfson Children’s Hospital serves children from North Florida, South Georgia and beyond. May God Continue Bless this Family!! !